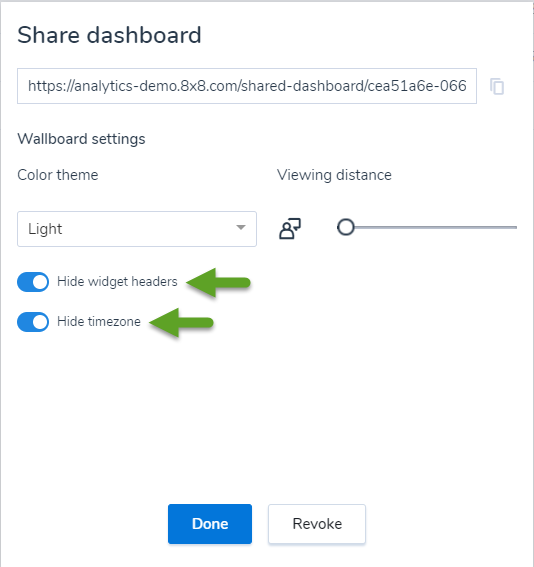 What's New in the 8x8 Analytics 1.3.1 Release? 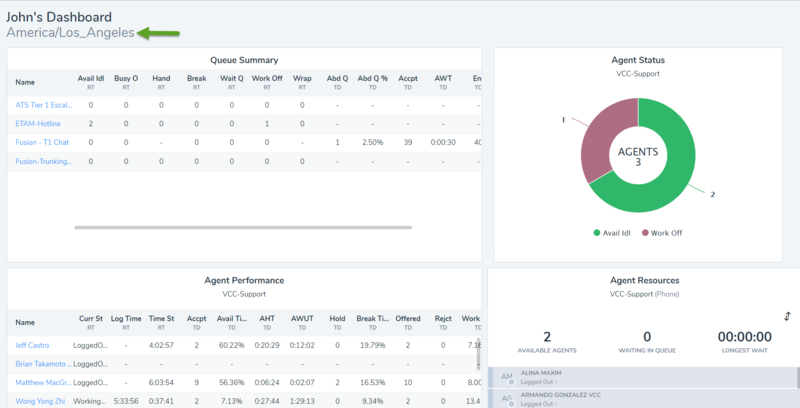 We have introduced new enhancements and changes in the Virtual Contact Center Analytics 1.3.1 release. 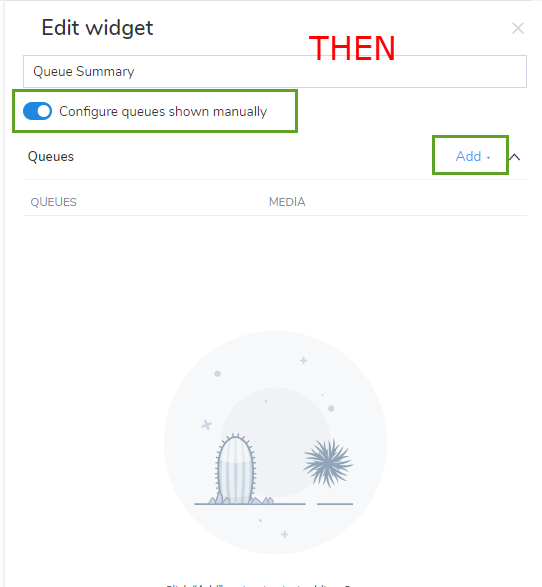 In queue summary widget and agent performance widgets, we have introduced a few improvements in selecting agents, queues, or metrics. 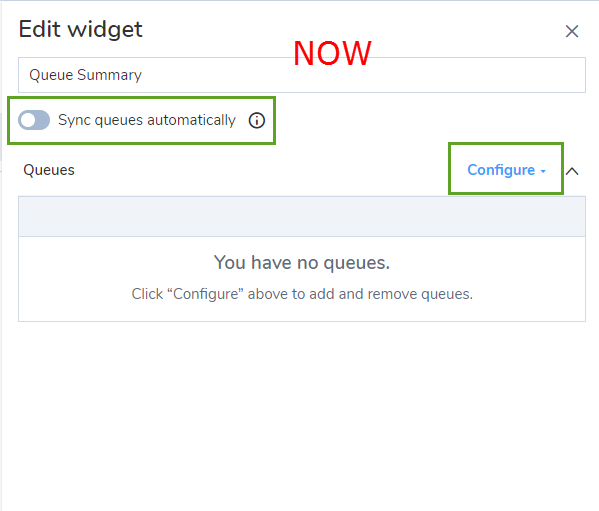 Label changes: In the Queue Summary widget, the toggle option Configure queues shown manually is now relabeled as Sync queues automatically. 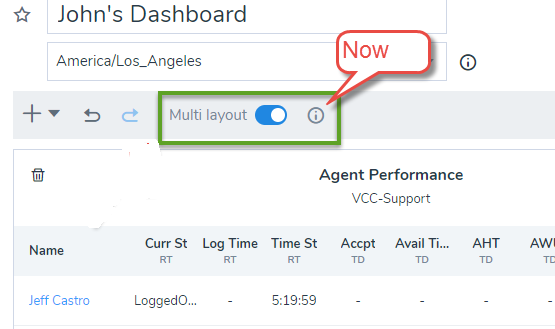 In the Agent Performance widget, the toggle option Configure agents shown manually is now labeled as Sync agents automatically. The Add link is now labeled as Configure. On-screen messages such as "You have no queues" guide users to take the appropriate steps. By default, the option to sync queues or agents automatically is enabled. For queues, it selects all queues you are assigned to. For agents, it selects all agents supervised by you. Disable this setting to select the desired queues or agents manually. You can select items individually from the list or filter by keywords and select those that match the search criteria with a single click. With a single click, your dimension selections are populated to the widget. View for lengthy queue names: In the Queue Summary widget, we have introduced hover-over tooltips that reveal the queue names in their entirety. Hover over a queue to view the queue name in entirety. It is helpful while you are selecting queues with long names that are truncated (for example: Tier_Billing_en, Tier_Billing_es). For optimal use of real estate on the display screens of wallboards, we allow you to hide time zone and widget header information. In the wallboard settings, toggle the options as desired. Zebra striping is the faint shading of alternate rows of tabular data to guiding eyes along the rows. We have now applied the zebra striping format to our data tables in wallboards for enhanced readability. Avg Offering Time (Queue Summary widget): The average time it takes to accept an interaction from the time it is offered to the time it is accepted. This metric is applicable to queues. For example, if average offering time of a queue exceeds 10 seconds, you can investigate further by reviewing the average handling time of the queue members in the agent performance widget. Longest Offering Time (Queue Summary widget): The longest time it takes to accept an interaction (compared to all the interactions that entered a queue) from the time it is offered to the time it is accepted or rejected by an agent. Longest Offering Time (Agent Performance widget): The longest time spent by an agent before accepting or rejecting an offered interaction. (Time starts from the moment the interaction is presented to the agent to the moment the agent accepts or rejects. Defining your dashboard layout to suit your screen size is now simpler and easier to improve the user experience. The basic and advanced layout menu is enhanced to a multi-layout toggle. With the enhanced layout, you can now view the dashboard layout you are editing. While resizing your browser, a message indicates that you are editing the small, medium, or large-screen layout based on the browser size. The average diverted time is the average time spent by all interactions that entered the queue and left without the interaction being accepted by an agent (typically forwarded to another queue, agent, or voicemail as a result of logic within an IVR script). Improved queue selection: Select all queues with just a click. Improved experience with finding queues: The queues are now grouped and displayed based on media type; chat, phone, or voicemail. You can find and select all queues of a specific media type quickly. Improved search: When you search by keywords, you see all queues that contain the search keywords. Select all agents quickly with a single click, and click Add Selected Agents in the search filter. Search for an agent by first or last name, select the desired agents from the resulting list, and click Add the selected agents. We have modified a few navigation icons in the application interface. 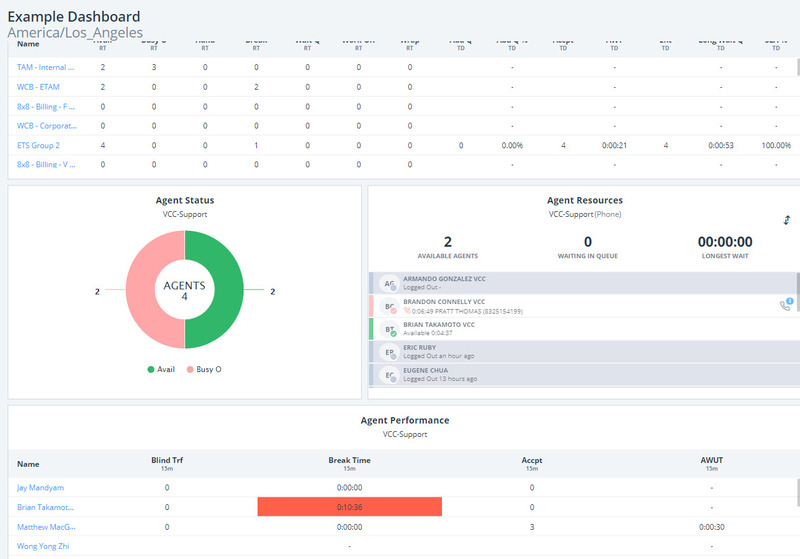 As a contact center manager who monitors agent performance or the call handling capability of a queue, you want to closely monitor certain key performance indicators (KPI) to ensure customer satisfaction. Whether it is the call waiting time in a queue, or the longest hold by an agent, you want to access these KPIs quickly without having to hunt for them on your data-rich dashboard. 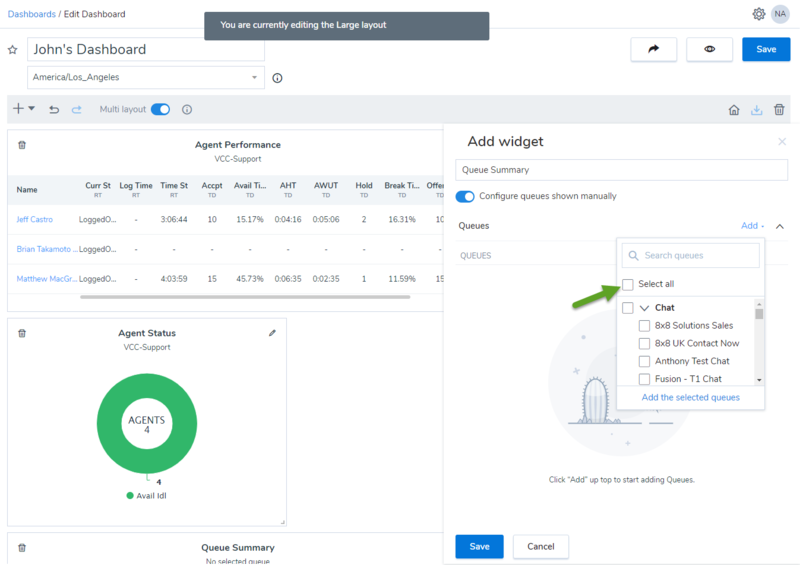 With the new single metric widget for agents or queues, you can now select an important metric and create a widget to display these critical KPIs prominently as desired. This improves the visibility of the most important metrics. Watch whether the average handling time of an agent call exceeds five minutes, or if the longest waiting time for a queue exceeds a certain time limit. These widgets draw immediate attention to the KPIs on the dashboard. Get to the numbers quickly, and act to take corrective actions. Learn how to create a single-stat widget for queue and agent performance metrics. Instead of the dd/mm/yyyy format, the date format on timestamp metrics is now MMM dd, yyyy hh:mm:ss a, as in Dec 2, 2010 2:39:58 AM. Time is changed from a 24-hour format to an AM/PM format. Ability to set thresholds for custom metrics: You can now set thresholds for custom metrics you created for queues or agents. While creating a threshold, simply select the desired custom metric, apply the visual and sound notification alerts. 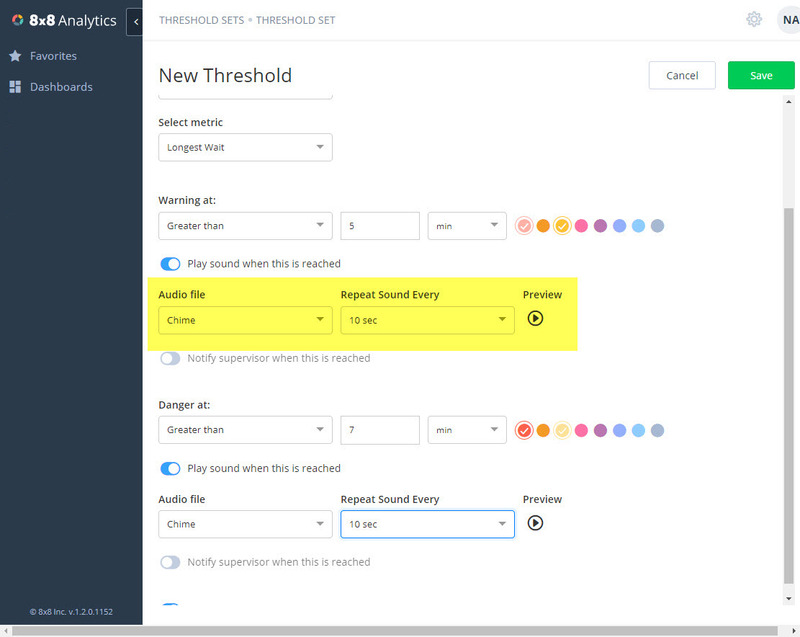 Threshold Notifications via audio alerts: In addition to the visual alerts, you can now set an audio alert. You can select from a choice of sound notification types, and control the interval at which sound alerts occur. Choose from various sound notification types; chime, ding, or long alert. Choose from various intervals: 0 sec, 10 sec, 30 sec, or 1 min. Note: If you select the 0 sec interval, the notification rings only once when the threshold is met. To learn more about defining threshold sets, click here. Total Interactions Handling: The total number of interactions being handled by agents. This includes all interactions from the time an agent accepts an interaction until wrap-up. This excludes interactions that are in the wrap-up state. Total Interactions Wrap Up: The total number of interactions currently being handled by agents in the wrap-up state. Renamed Metric: The metric that was previously referred to as Available is now called Available Idle, and indicates the total number of agents enabled, assigned, and in the available state (idle waiting). Short abandonment: Calls that were dropped by the caller before being accepted by an agent. By default, this is set to 10 seconds, and covers calls abandoned by the caller before reaching 10 seconds or before being accepted by an agent within 10 seconds. Abandonment: Calls that were abandoned by the caller after waiting for a specified duration greater than 10 seconds. Total abandonment: The total number of calls abandoned by the caller, and is counted as (Short abandoned calls + Abandoned calls). Refer to the glossary for the complete list of metrics. In addition to the vast number of metrics available out of the box, you can now create custom metrics based on existing metrics to derive data specifically tailored to your needs. Simple arithmetic operations of addition, subtraction, multiplication, and division can be applied. You can configure custom metrics for queues as well as agent performance widgets. Basic validations prevent you from adding unsupported metrics. Once you define a custom metric, add it to the desired dashboard widgets. Example 1: Let’s say you want to know the number of successful calls in your queue, those that entered the queue and were not abandoned. Simply create a custom metric by subtracting the abandoned calls from the number of calls that entered a queue. Example 2: To determine the total number of calls handled within a queue, subtract the calls that were diverted from the queue to another queue or another phone number from the calls that entered the queue. In the top-right corner, click under your name and select Custom Metrics from the menu. Description: Add a description of the metric. Formula: Add the correct formula to calculate the custom metric; use arithmetic operations (addition, subtraction, multiplication, and division). Example: To find out the number of successful calls in a queue, select Queue Set, add other details in step 4, and enter the formula Entered - Abandoned. Once you define a custom metric, you need to add it to the desired dashboards. In the edit mode, click Add under Metrics, search for Successful Calls, or scroll down to find and select to add. In this release, you can track metrics for outbound phone media type. Whether it is the number of calls handled in an outbound queue for the day, or tracking the performance or status of agents serving the outbound phone queues, 8x8 Analytics now provides data for outbound phone queues. 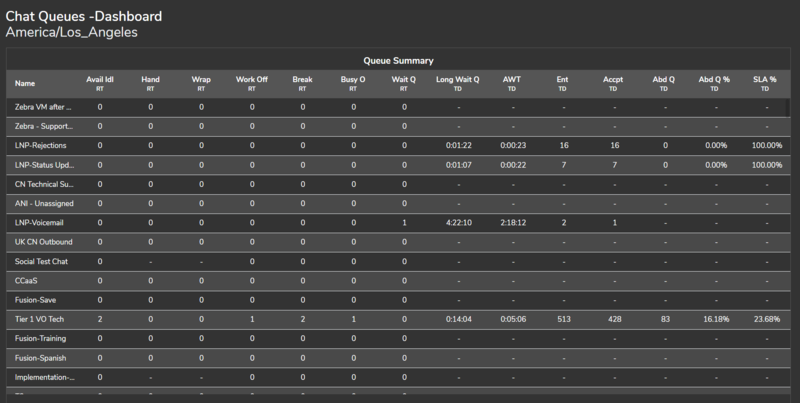 While creating a widget, select an outbound phone queue to view the metrics. With support for the chat media type, you can now track metrics for chat interactions handled by agents. 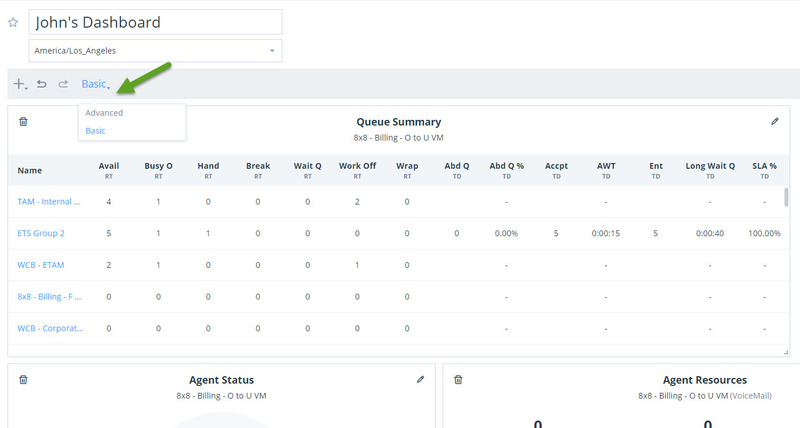 In the Queue Summary widget, select chat queues and track the number of chat interactions waiting in the queues, number of agents available to process these chats, average handling time, and more! Find out the number of accepted and diverted chats, average handling time and more by selecting the chat queues in the dashboard widgets. With extended support for the voicemail media type, you can now track desired metrics for voicemail queues. In a queue summary widget, select voicemail queues, and fetch the metrics for the number of voicemails accepted and handled by the agents. Choose voicemail queues to fetch the desired voicemail metrics in the dashboard widgets. 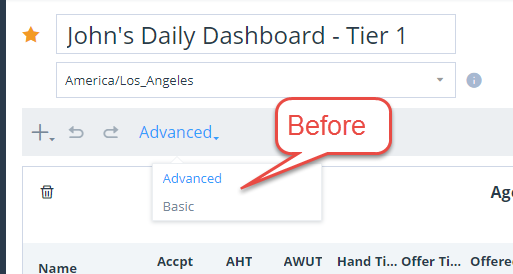 You can now define thresholds to alert supervisors when agent performance metrics slip below a desired value. Threshold alerts can warn you about performance shortfalls and necessitate action. As a supervisor, you want to ensure agent productivity. Let’s say you want to be notified when an agent has placed a caller on hold for longer than two minutes, or when an agent takes a longer break than the scheduled break time (such as 15 minutes). 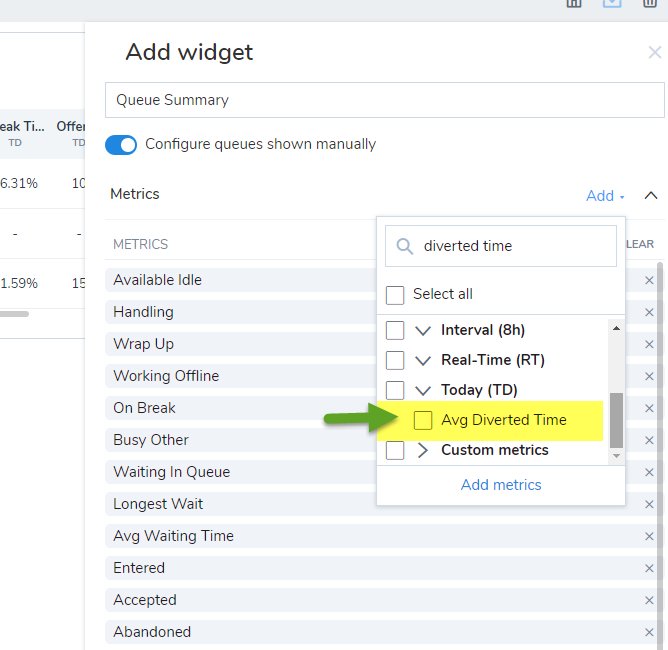 Define threshold alerts for break time and hold time metrics in your dashboard, and assign them to the desired queues. On your wallboard, you see visual warnings when the values exceed the thresholds, indicating the need for further action. You can create thresholds to track metrics for queues or agents. To learn more about adding thresholds, click here. Dashboards are now available in Basic mode and Advanced mode. The Basic mode allows users to create one optimal viewing resolution that works for all monitors. 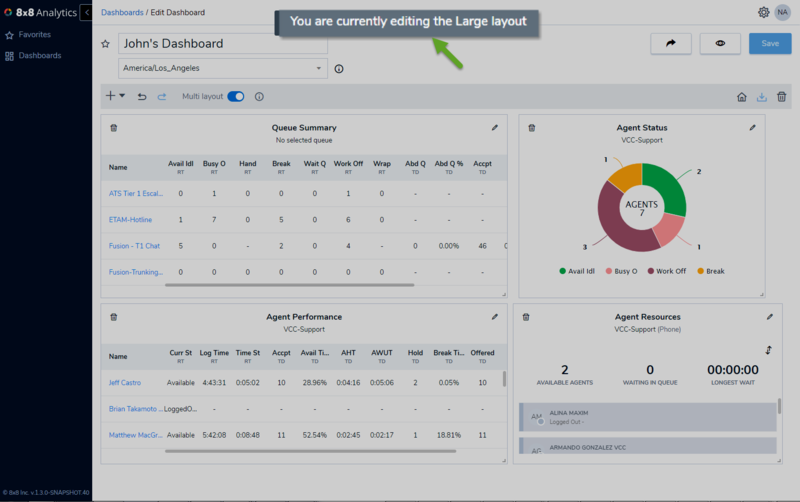 You do not need to create an individual dashboard layout for each screen size. The Advanced mode gives you the flexibility to define the layout and size of the dashboard to suit the varying screen size. Whether it is your computer screen, a monitor screen, or a big TV, customize the layout of your widgets to suit the screen size for best viewing. To select the basic mode, select to edit a dashboard. Click the drop-down button next to Basic. Select Basic or Advanced mode. While creating a new dashboard, the tenant time zone that was set up in Configuration Manager is applied by default. You can apply the desired time zone by selecting it from the drop-down list.